Hanabi is the Japanese word for Fireworks, made up of the kanji for “fire” and “flower”. 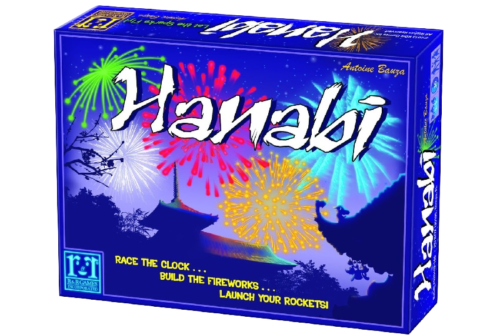 Hanabi is also a cooperative card game that requires you to listen to your teammates and trust them. The story of the game is that a group of fireworks technicians have to get ready for a performance, but have mixed up all the parts they need to make 5 rockets for the show. Will there be a celebration to remember, or will your efforts fizzle out? The game consists of 60 cards numbered one to five in 6 suits (blue, green, red, white, yellow and rainbow). The rainbow suit is set aside for expert level games. There are also 8 blue clock tokens and 4 black fuse tokens. To begin the game, the clock tokens are spread out on the table, and the fuse tokens are stacked so that the long fuse is on top and the explosion is on the bottom. If there are 3 or 4 players, everyone gets 5 cards. If there are 4 or 5 players, everyone gets 4 cards. AT NO TIME ARE PLAYERS ALLOWED TO SEE THEIR OWN CARDS! A player’s hand is held with the number values facing out, and new cards are drawn without looking at them. The only way you know what you have is by listening to the clues the other players give you. On your turn, you can do one of 3 actions. You can give another player a clue about the cards in their hands. You can tell them which cards they have of one colour, or one number, but not both. For example, you can say “you have three green cards” or “you have two 3s”. When you give a clue, you are allowed to point to, or even touch, the specific cards you are referring to. 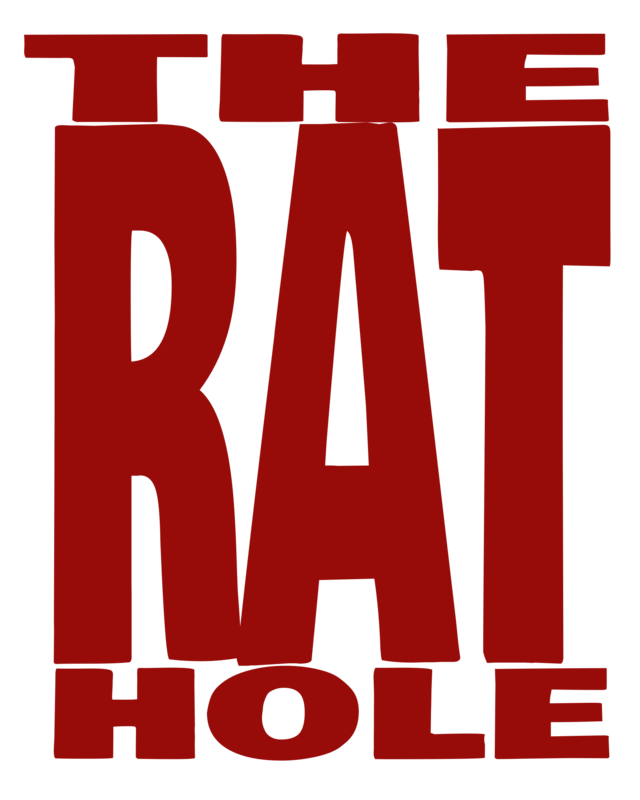 The player receiving the clue can rearrange their cards to help them remember your clue. Each time you give a clue, you must take away one timer token and put it in the game box. The second action you can choose is to play a card. The goal is to create sets of cards going from 1 to 5 in each colour. If the card you play starts or continues a set, congratulations. But if your card doesn’t work, then you must discard it, and take away one of the fuse tokens. If you reveal the explosion, the game ends immediately. If you play a card, draw a new one. You should always have 5 cards in your hand. The third action you can take is to discard a card. You must clearly declare that your card is a discard. This is a risk, because if you aren’t completely sure what you have, you could throw away a card you need. There are multiple of each number per suit, except for the fives. If a five is discarded, then that colour cannot be completed. The discard pile can be searched at any time, to see if a needed card is lost. The act of discarding a card brings back one clock token. Any time a five is successfully played also returns one clock token. Again, after discarding, draw a card. In spite of the blue tokens being called “clocks”, running out of “time” does not end the game. It just means that no one can give any clues until tokens are recovered. The game ends if (as mentioned before) the explosion token is revealed, if all five “rockets” are successfully built, or one round after the last card in the draw pile has been picked up. After the last round, it’s time to tally the score. Add up the highest number for each colour and compare the total to the “artistic impression” chart in the rules. Ratings range from “the audience booed” to “a legendary performance, everyone was left speechless”. The only exception to this scoring system is if you choose the Emperor’s Favor variant. In this case, the game does not end when the last card is played. Reshuffle the discard pile and continue until the fuse burns away, until an essential card is discarded, or you complete all the rockets. Since your show is for the Emperor Himself, it must be perfect! Once you have played a few games, you can try adding in the rainbow suit. There are three ways to do this. You can treat the new cards as another suit, the same as all the others. You can have the rainbow suit be a “difficult” suit, with only five cards instead of ten. The third, most challenging version has the rainbow as a “secret” suit. Meaning that, when giving clues, you can’t call a card “rainbow”. You have to describe it as another colour. However, when the card is played, it becomes a separate suit. R & R Games can be found online at rnrgames.com or on Facebook at facebook.com/RnRGames.